A trail is a path that's made in the ground when people walk in the forest. It can also describe any series of marks or signs that someone leaves behind them as they go somewhere. Since a paper trail provides proof or evidence of something, it can help or hurt someone depending on the situation. A paper trail is a series of records that are written or can be printed on paper (such as letters, journals, diaries, receipts, financial ledgers, phone records, computer files or email). My advice is to always keep a paper trail of emails and notes so you have proof that your boss keeps asking you to do personal work and errands for her. My dog left a paper trail of shredded tissues proving she'd been in the bathroom again. My assistant left a paper trail of emails and documents showing she spent 90 percent of her time working on her university assignments instead of doing her work. The defendant was easily convicted because he left a paper trail confirming his illegal activities. The transfer of so much money over the course of three years means there has to be a paper trail of their activities somewhere. When we cleared out my father's office after his death we discovered a paper trail leading us to his secret life with another woman and half-siblings I never knew about. Before you submit your resignation make sure you destroy any paper trail of personal documents on your computer and in your files. The auditor said our former CFO left a paper trail confirming he was embezzling money from the company. I'm sure they left a paper trail here but we'll have to sort through about 250 file cabinets to find it. Have you signed-up for my free newsletter? It's the best way to learn about new updates to my website and notices of when I launch new writing contests. 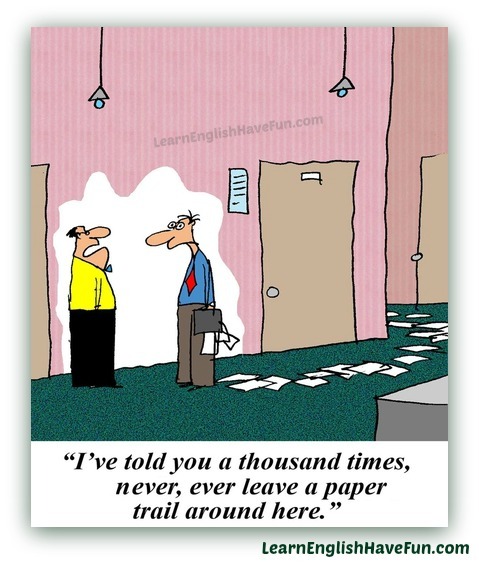 Have you left a paper trail before? If so, please tell us about it in the comments below. If not, please feel free to write any sentence to practice your English. This is the best way to remember new vocabulary and idiomatic expressions. Plus, I will provide feedback on your comments.